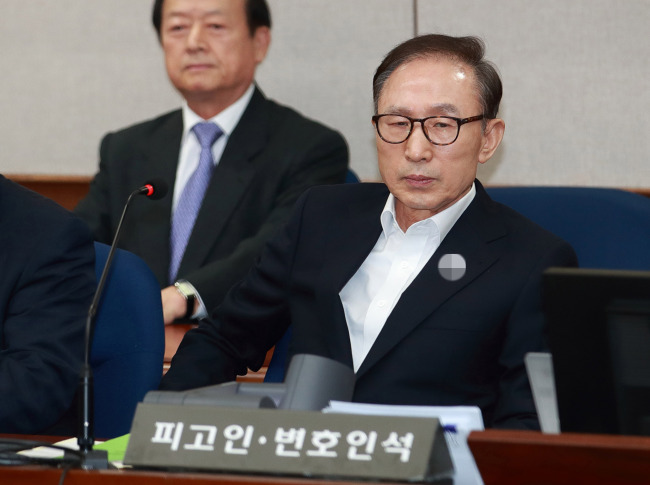 Former President Lee Myung-bak denied the charges against him at the first hearing of his trial Wednesday, accusing the prosecution of conducting “unreasonable” investigations. At the Seoul Central District Court, the 77-year-old former leader attended his hearing held at 2 p.m., making his first public appearance 62 days after he was arrested in March 22 over a series of charges including bribery and embezzlement. “I stand here today with grief. I could not take in the claim (of allegations), as I am a person who served as a president of a nation. I had vowed to the people that I would obey the Constitution,” Lee said in a 10-minute speech at the beginning of the trial. On April 9, the prosecution indicted Lee on 16 charges, including embezzlement of tens of billions of won, bribery and abuse of power. The conservative former president, who was in office from 2008 to 2013, is the fourth former president to be arrested and put on trial for corruption. In Wednesday’s hearing, Lee read from a paper he had prepared to address several allegations raised against him and claimed innocence. “It is just hard to understand about (the allegations involving) DAS. My brother and brother-in-law created the company in 1985. And no disputes have ever occurred between family members. It is unfair for the state to intervene in its management,” he said. The prosecution has concluded that Lee is the real owner of the controversial auto parts maker DAS, which belongs to his eldest brother Lee Sang-eun on paper. Lee Myung-bak is suspected using DAS to amass slush funds totaling some 33.9 billion won ($31.7 million) from 1994 to 2006, and using the money for political activities as well as private purposes. The former president is also suspected of receiving a kickback of $5.85 million from Samsung Electronics in the form of litigation fees it paid on behalf of DAS between 2007 and 2011. He also spoke about his impoverished childhood and how he had pledged to return all of his wealth to society when he was a presidential candidate. Lee is also accused of receiving about 11.1 billion won of bribes from the state spy agency, individuals and businesses.